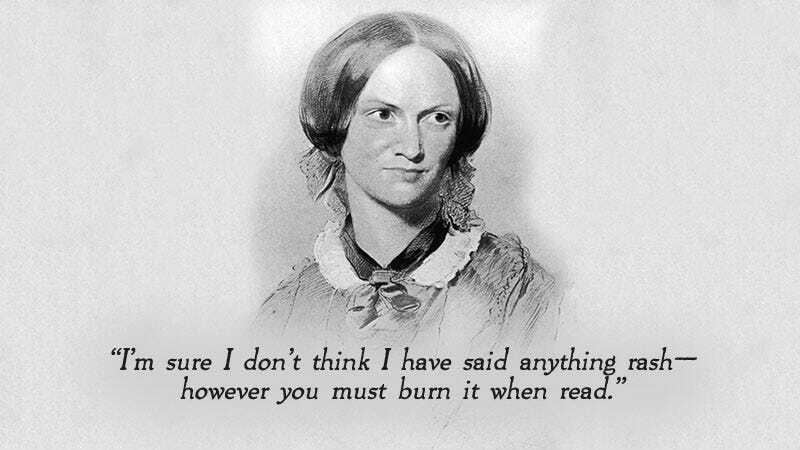 Illustration by Bobby Finger, image of Charlotte Bronte via Getty. Biographies live or die by the documents their subjects leave behind. If the paper trail is thin—few letters or bills, not much in the way of diaries—filling out even a basic life’s outline, especially from the distance of years and years, gets increasingly tougher. All the people who knew the subject die, and with them, any chance at a living, breathing book which cuts to the essence, which says something new in a way we haven’t read before. And letters, in particular, are vital. “Letters prove to us that we once cared. They are the fossils of feeling. This is why biographers prize them so: they are biography’s only conduit to unmediated experience,” Janet Malcolm once explained. One of the best documented novelists of the 19th century is Charlotte Brontë, thanks in large part to the fact that she was a lifelong, avid writer of notes, stories, little (sometimes just three inches tall) books and manuscripts, and of letters. Over her lifetime Charlotte wrote thousands of letters to a wide array of correspondents: her family, when she was away from home; close friends; and later in life, her publisher and editors, as well as other famous writers. Her two longest correspondences were with her closest school friends—the smart, outspoken, and liberal Mary Taylor, and the quiet, more proper Ellen Nussey. “He says women are most rash in letter-writing,” she added. This long exchange is hard to read: burn the letters of Charlotte Brontë?! Modern eyebrows raise at the suggestion of a new husband “censoring” the “rash” correspondence of two women—lifelong friends. But it’s all made easier to ingest by the fact that we know “dear Nell,” as Charlotte often called her, who lived until 1892, never made good on her promise, and 380 letters that Charlotte wrote to her over a span of 24 years survive. Indeed, Ellen devoted the remainder of her life to trying to get the letters published and into the hands of people who would understand their value. In this massive corpus, one gets precious glimpses of the everyday life of the famed novelist, and her equally talented but less prolific sisters, Emily and Anne. Ellen, Charlotte’s closest friend, received letters on the deaths of Branwell and Emily. Indeed, Ellen accompanied Charlotte and Anne to the spa town of Scarborough, where Anne would die in May 1849, two single women giving a last look at the sea to a mortally ill and frail companion. Ellen and Charlotte were reconciled shortly after, and Ellen went on to become a primary source for Elizabeth Gaskell, who wrote the first biography of Charlotte after she died. Charlotte’s father, the Reverend Patrick Brontë, also cooperated with Gaskell—though he regretted it once he read her portrayal of him as harsh and eccentric. Charlotte Brontë was an adept correspondent who tailored the tone and content of her letters to their recipients. Her letters to Ellen are full of everyday family details, friendly gossip, and affection. The few letters which remain of her correspondence with Mary Taylor are—as one could guess from the scorching tone of Mary’s letter to Ellen—more political and fiery. Mary was a different kind of friend than Ellen: the kind who protectively torched most of her friend’s letters after her death, never mind the rabid appetites of biographers. But Charlotte also kept much from her friends. Though she shared her hardships over her beloved brother Branwell’s descent into addiction, she didn’t utter a word about her foray into the world of authorship, even as the three sisters published a book of poetry, and then, their first novels: Charlotte’s Jane Eyre, Emily’s Wuthering Heights, and Anne’s Agnes Grey, all of which appeared in 1847. The secret wasn’t kept long, of course, as many of the characters and scenes in the books were so clearly reminiscent of their Yorkshire village and its surroundings. She also appears to have shared nothing of her painful experience in Belgium when, at the age of 26, she went to teach and learn French at a school run by a husband and wife duo, the Hégers (dragging Emily along, too). By far the most moving and painful pieces in all the Brontë correspondence are the four letters that have survived of Charlotte’s communication with Constantin Héger, her French teacher from her two years abroad, from 1842 to 1844. Charlotte remained alone in Brussels long after Emily darted back home, and she formed an attachment to Héger while there. Indeed, she was clearly in love with him. He respected her talents and challenged her intellect. Upon her somewhat abrupt, permanent return home in January 1844, Charlotte fell into a deep depression which would end finally in her embarking on her literary career in earnest. Evidence suggests she wrote to Héger about twice a week until—at the insistence of his wife—she confined herself to writing just every six months. Letter from Charlotte Bronte to Constantin Héger, via the British Library. The letters begin in July of 1844, clearly mid-correspondence. All of them are written in French. The next letter which survives was written three months after the first. The third letter, again after a passage of three months, is heartbreaking. “Forgive me then Monsieur if I take the step of writing to you again—How can I bear my life unless I make an effort to alleviate its sufferings? “I know that you will lose patience with me when you read this letter—You will say that I am over-excited—that I have black thoughts etc. So be it Monsieur—I do not seek to justify myself, I submit to all kinds of reproaches—all I know—is that I cannot—that I will not resign myself to the total loss of my master’s friendship—I would rather undergo the greatest bodily pains than have my heart constantly lacerated by searing regrets. If my master withdraws his friendship from me entirely I shall be absolutely without hope—if he gives me a little friendship—a very little—I shall be content—happy, I would have a motive for living—for working. The letter gives more than a few clues to the powerful writer Charlotte had become, and her desperate object is clear: she must induce him to respond, trolling him with different voices: now desperate, then logical; but she ends her letter in that other hallmark of her voice, anger. And through these long months of “torment” that Charlotte was enduring, her letters back and forth to Ellen and others continued, in stark relief to the emotional letters to her “master,” they give no hint to her near constant turmoil. It is clear that the tone of this letter is slightly more resigned, though no less fervent, than the ones which preceded it. In fact, Charlotte was already deeply committed to editing her poems and at work on her first novel, The Professor, which was not published in her lifetime. The book’s subject is clear from the title, but there are clear echoes of Héger in both Jane Eyre’s Edward Rochester, and even more so in Villette’s Paul Emanuel. Charlotte had already begun to spin her painful experiences into powerful prose, though Jane Eyre would not be published for another two years. These letters were shown to the novelist Elizabeth Gaskell by Monsieur Héger, less than a year after Charlotte’s death, when she travelled to Brussels on the trail of writing her biography of the author, the first of many. Gaskell chose—for somewhat obvious reasons—not to publish the letters and to suppress almost completely the relationship between Héger and Charlotte. Three of the four letters were at some point torn apart then painstakingly sewn and taped back together. They eventually passed to one of Héger’s children after his death, and were published in The Times in July of 1913 before being given to the British Library. They were received by the world, of course, with shock, and have changed biographers’ view of her almost completely since. Taken as a whole, these letters descend into such gut wrenching, desperate sadness, that they do indeed force the reader to consider that maybe it would have been better had they not survived. When reading them, one is deeply aware of seeing something never intended for our eyes. Instead, they made it, with one still showing Héger’s scribbled marks—the address of a local shoemaker, perhaps—as if the letter had sat carelessly on his desk. They remain, simultaneously so carefully preserved and such evidence of having been tossed away. However, they are also the best, and most direct gaze into the creative process of Charlotte Brontë’s genius. These four letters alone contain the emotional inspiration for most of her novels. Nowhere else in her long and glorious surviving correspondence—the latest version three volumes—is she so deeply exposed and honest. In fact Brontë so affected the people in her life that many of them saved what so often is lost to literary history. Her publisher, George Smith, kept the manuscripts for all her published work, along with hundreds of letters she’d written. Today, those manuscripts and the letters to Héger live permanently in the British Museum, while much of the rest of her surviving collection is housed at the Bronte Parsonage Museum, in Yorkshire, in Charlotte’s former home. It’s no wonder Arthur wanted the whole of it committed to fire, but thankfully for us prying fangirls, he didn’t get his wish. The story of the survival and publication of Charlotte Bronte’s private letters is a wonderful example of the problem of biography as laid out by Janet Malcolm in The Silent Woman and indeed, after reading Charlotte’s letters, one is certainly left with the feeling of “simply listening to backstairs gossip and reading other people’s mail.” Malcolm writes that the “transgressive nature of biography is rarely acknowledged, but it is the only explanation for biography’s status as a popular genre.” In the letters of Charlotte Bronte—editorialized anew every few years, leading to scant improvement of the narrative story of her life—we find these words embodied completely. Laura June is a Staff Writer for The Cut. She burns all of your letters. Illustration by Bobby Finger. Image of Charlotte Bronte and Jane Eyre manuscript via Getty. Letter via the British Library.